Second T20I, Bangladesh vs Afghanistan. Result : Afghanistan won by 6 wickets. 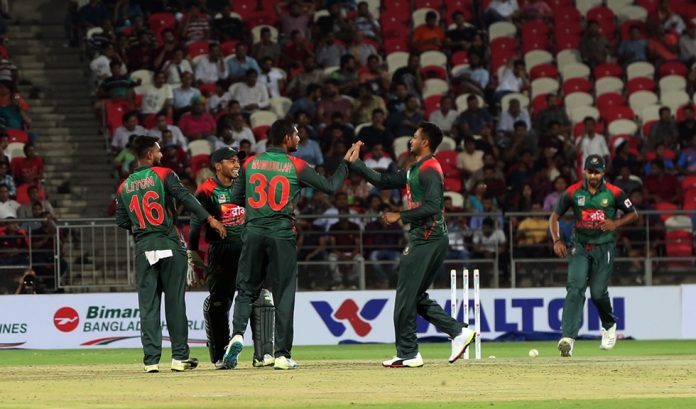 Bangladesh have lost the second T20I against Afghanistan by 6 wickets at Rajiv Gandhi International Cricket Stadium, Dehradun, India. With this win, Afghanistan clinched the 3-match series by 2-0. After winning the toss, Shakib Al Hasan decided to bat first. 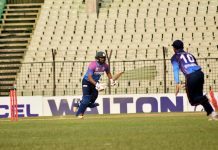 After the early departure of Liton Kumar, it was Sabbir Rahman who showed some aggression. But he too gone after scoring 13. Then Tamim Iqbal and Mushfiqur Rahim added 43 runs in the 3rd wicket stand. Bangladesh innings had an setback as Rashid Khan bagged three wickets in one over. He bagged the wickets of Shakib, Tamim and Mosaddek in 16th over and put Bangladesh on tremendous pressure. A quick-fire knock of 21 off 14 balls from Abu Hider helped to post 134 for 8 after 20 overs. Rashid took 4 wickets for 12. Defending a low total, Bangladesh needed a good start. Nazmul Islam restricted the Afghanistan from scoring big in the power-play with two maiden overs. Abu Hider got rid of Shahzad on 24. Couple of wickets from Rubel and Mosaddek has increased the run-rate for Afghanistan. But Mohammad Nabi sealed the match for his team inside 19 overs with a unbeaten cameo of 31 off 15 balls. Mosaddek grabbed two wickets for 21. Third and final match of the series will be held on June 7 at the same venue.